This week's Beauty Find is courtesy of one of our frequent beauty testers who is Hispanic (Puerto Rican) about America Ferrara's complexion with combination skin and good skin tone. "This is a foundation lover's dream! 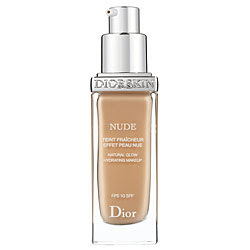 I loved that I could achieve a dewy natural look with this product - which is my favorite. The foundation has a light, creamy consistency, yet it is a liquid. Only a few pumps were needed to fully cover my face. I found that it blended very easily using my fingers, but I also got great results using a foundation brush. It didn't feel cakey or heavy on my skin. The foundation covered both my drier areas like my cheeks and my oily areas like my T-zone equally well. After applying it, I didn't feel like I even had foundation on, I just looked radiant and my skin was very well hydrated. This is a "luxury foundation" but in my opinion you will certainly be getting a superior product for the money. Also, because so little is needed for normal/medium coverage, this will last a 3-5 months at the very least, even using every day. This is the perfect foundation for those of you who have fairly good skin, need a bit of coverage, and want a dewy, luminous finish that will also stay in place all day." Y.L.